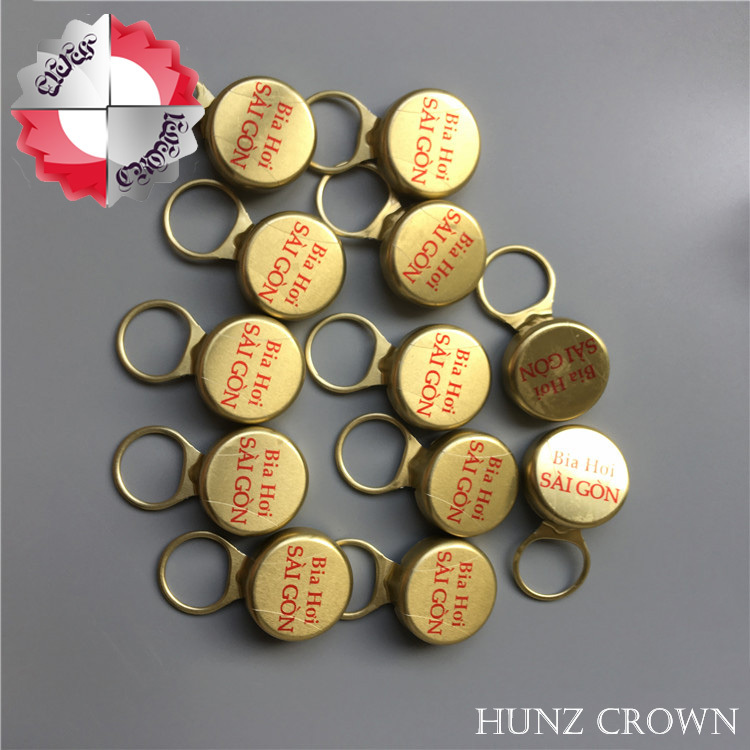 Our development of the latest patent product "crown easy pull bottle caps, the bottle opener is used to open a bottle of thoroughly solved history, low production cost, good appearance, the degree of automation and high technology, with strong market competitiveness. Approved by EU. Aluminum Closure,wholesale bottle caps. (1) easy to pull off. 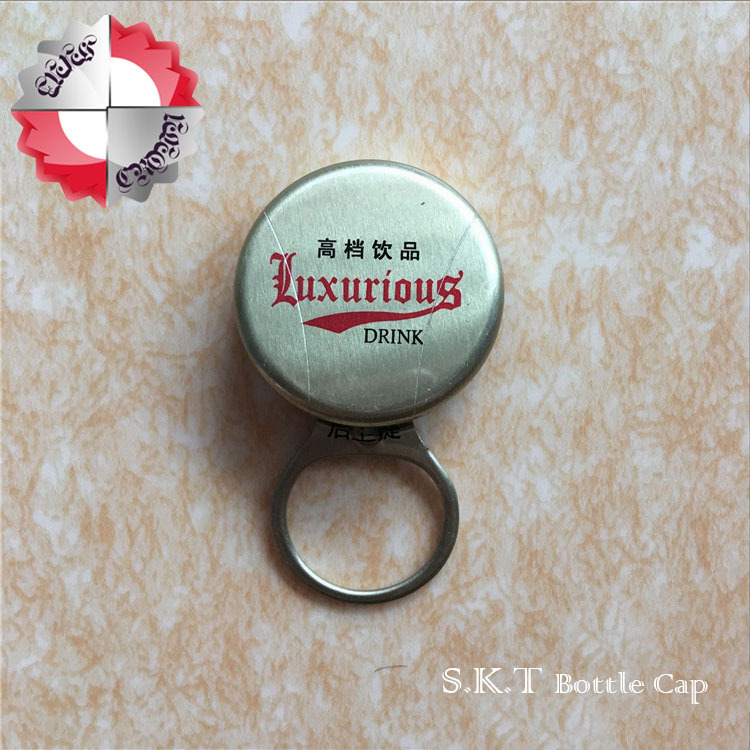 The product is attached to the top surface, and it is easy to open the bottle cap with the hand, so that the consumer not only opens the bottle easily, but also gets a kind of beautiful enjoyment because of its novelty feeling. (2) easy to use. The appearance and size of the product are the same as the original use of the iron beer cover. Therefore, there is no change in the use of the beer canned equipment. (3) safety and explosion-proof. The crown is easy to open and the explosion-proof bottle cap is made of automatic precision equipment. The use of it is to add a safety explosion-proof device to the glass bottle, so as to completely remove the danger of glass bottle's explosion due to excessive pressure. (4) patent protection. The product has been granted a number of national patents, producers and users are protected by the State Intellectual Property Rights, and can effectively prevent counterfeit and shoddy. (5) multi product use. It is not only used in beverage packaging, but also in the packaging of beer, liquor, drinks and condiments. SKT is a privately owned flexible company. The company is customer oriented. Service is quick and reliable due to the benefit of our in-house prepress and offset printing facilities. abundant experience of designing & manufacturing ring pull closures and ring pull cap sealing machines gives Hunz crown a unique depth of knowledge. This is reflected in the level of service and support given to customers. Research & development of bottle caps and ring pull sealing machines is being continuously undertaken. SKT is approved under ISO 9001 quality, health & safety at work. Main products: Aluminum Closure,wholesale bottle caps etc.